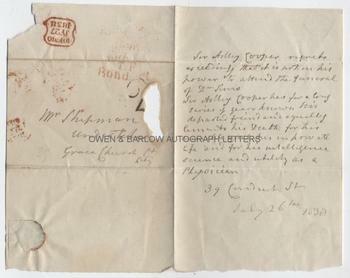 SIR ASTLEY PASTON COOPER autograph LETTER. British (English) surgeon and anatomist. AL. 1p and integral blank leaf serving as a letter cover. 39 Conduit Street. July 26th 1838. To Mr Shipman, Undertaker, Gracechurch Street, City. "Sir Astley Cooper regrets exceedingly that it is not in his power to attend the funeral of Dr Sims. 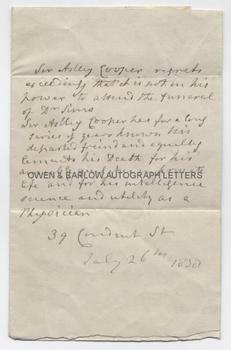 Sir Astley Cooper has for a long series of years known his departed friend and equally laments his death for his amiable qualities in private life and for his intelligence, science and utility as a physician". 8vo. Approx 7.5 x 4.75 inches. 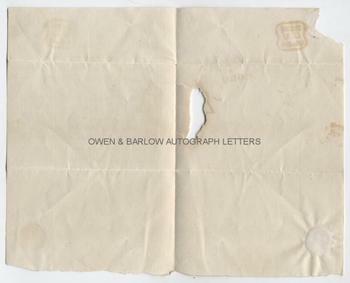 Some losses to integral blank caused by careless opening of the integral letter cover, very slight edge creasing, else fine. Sir Astley Paston Cooper identified several new anatomical structures, many of which were named after him. He is best known for the major advances he made in the field of vascular surgery, particularly in cerebral circulation. He was the first to demonstrate the effects of bilateral ligation of the carotid arteries and to propose treatment of aneurysms by ligation of the vessel and his most famous experimental procedure is probably his attempt to tie the common carotid artery for treating an aneurysm, which he first performed in 1805. He was surgeon to George IV, William IV and Queen Victoria, president of the Royal College of Surgeons and vice-president of the Royal Society.